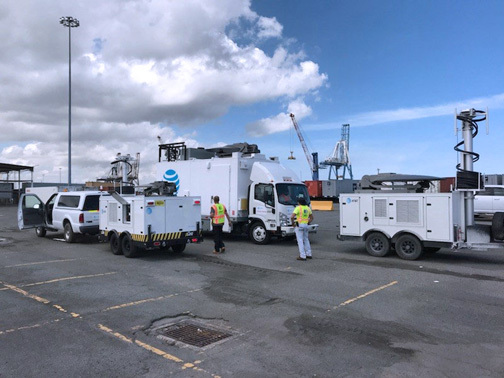 AT&T equipment arrived at the port of San Juan on Sunday. AT&T confirmed Monday it is currently connecting more than 8 million calls and 4 million texts a day over its network in Puerto Rico, as it continues to work around the clock to restore its network, which also covers the U.S. Virgin Islands. The wireless carrier has temporary cell sites providing connectivity to Ponce, Arecibo, Humacao, Rio Grande, and Aguadilla. In addition to the 8 million calls, these sites have carried more than 100,000 calls and 500,000 texts per day for the last three days, the carrier added. It plans to deploy temporary sites in additional cities, including Mayagüez, Fajardo, and Guavate. A ship arrived Sunday in San Juan with three more of its temporary cell sites, trucks, Emergency Communications Portable satellite units, generators, and restoration equipment. AT&T was expecting an additional ship and cargo flight to arrive Monday with more equipment, temporary cell sites, vehicles, and personnel. The carrier also continues to deploy generators and distribute fuel to generators that are in place to power its wireless and wireline equipment on the island as the commercial power outage continues. “Our teams are actively working to deploy and help get people connected with family, friends, and emergency responders as quickly as possible,” it said in its blog. “Today and this past weekend, additional generators, vehicles, and personnel arrived in the USVI. We continue to execute our restorations plans and recover cell sites in impacted areas as conditions allow,” the carrier added. Getting additional equipment to the islands continues to be challenging, but ships and flights with more of AT&T’s communications equipment, generators, and personnel are scheduled to arrive in the coming days. The company’s team on the ground will begin deploying this equipment as soon as it arrives, AT&T confirmed. “We are making steady progress in deploying as many network resources as possible to get the people of Puerto Rico and the USVI connected,” the carrier said. Hey Buddy!, I found this information for you: "AT&T connects 8M calls, 4M texts daily over PR network". Here is the website link: https://newsismybusiness.com/connects-daily-network/. Thank you.